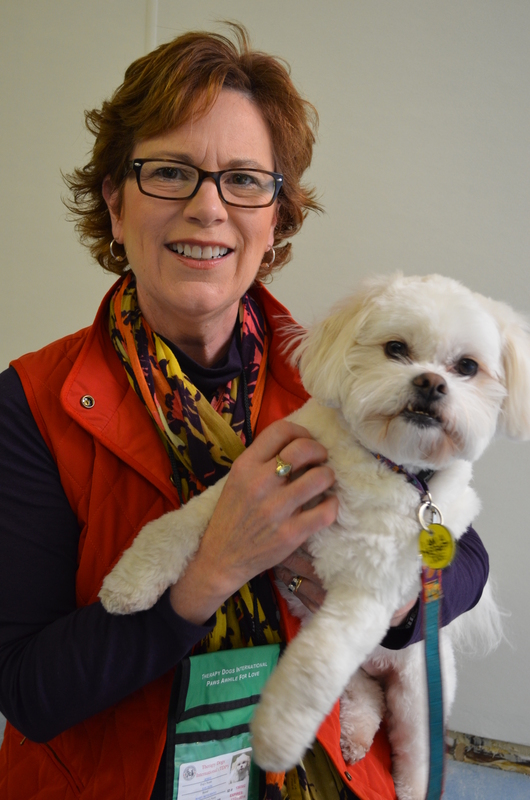 Dr. Pinto with her certified therapy dog, Jessie. One morning a week, Pinto and her dog Jessie, a certified therapy dog, visit physically and mentally challenged students at the Elizabeth Lee Black School at the Barber National Institute in Erie. The students in the classrooms that Pinto and Jessie visit have a range of physical and mental challenges, but many are diagnosed with Austism Spectrum Disorder. Pinto said Jessie is used to reinforce, teach, or reward positive behaviors – for instance, making eye contact, waiting patiently for their turn, or using a language card to point to the activity they’d like to do with Jessie. “Children on the autism spectrum often don’t like traditional means of reward—a hug, touch, or personal attention—but they love to throw the ball for Jessie or take her for a walk around the classroom,” Pinto said. For some, just petting Jessie is an important lesson. “Many children with autism don’t like physical touch, but they like to pet Jessie and that can help them bridge that gap,” Pinto said. Jessie revels in the attention, though his eyes are firmly locked on Pinto at all times. She’s a well-trained dog. And, she’s in big demand at the Elizabeth Lee Black School. Have a suggestion for a candidate for a future Secret Lives of Faculty/Staff feature? Email hjc13 at psu.edu. This entry was posted in Secret Lives of Faculty Members, Uncategorized. Bookmark the permalink. ← Behrend Reacts: How do you plan on finishing the spring semester strong?